Lamb's lugs with yellow-grey foliage and spikes of dark pink, woolly flowers. Upright spikes with whorls of violet-purple tubular flowers. 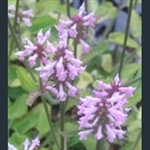 Hooded purply pink flowers emerge on strong stems from rosettes of hairy leaves. White-flowered form of the alpine betony; hairy leaf rosettes.